Former Wales and Ospreys lock Ian Gough says a Welsh Rugby Union plan which could lead to a merger of Ospreys and Scarlets "reeks of a shambles". The newly-formed Professional Rugby Board (PRB) will discuss the proposal on Tuesday as part of radical plans for regional rugby in Wales. It could create a new region in north Wales while reducing the professional teams in the south from four to three. "The union have just created a huge mess at such a vital time," said Gough. He added on BBC Radio Wales: "I struggled to get to sleep last night. "Wales are going for a Grand Slam, a tough trip to Scotland at the weekend, and they drop this on everyone. I'm dumfounded by it." If Tuesday's meeting agrees to the plan, there is a possibility the merger could be ratified this season and come in to force as early as the 2019-20 season. The discussions between the WRU and regions have been dubbed 'Project Reset'. Previous proposals had included merging Ospreys and Cardiff Blues but those plans fell through. The PRB is a gathering of representatives from the five professional entities in Welsh rugby - the WRU, plus regional sides Scarlets, Ospreys, Cardiff Blues and Dragons, who are owned by the WRU. Ospreys and Scarlets are fierce rivals, and have been the most consistently successful of the Welsh regions since their creation in 2003. Gough fears the WRU's plan for a professional team in the north of the country is not viable in the long term and risks alienating fans in one of the game's traditional hotbeds. "It seems they want it hell-bent, that they want to pin this tail on the donkey up north," he said. "In 2003 there was a huge divide in fans and it's taken a long time to get over that decision that was made back then. "Now all of a sudden you're going to completely alienate a huge amount of fans in this south Wales corridor again. "I just don't think it's been thought out very well. They're blindly running up this avenue up north, which I don't think will be viable in a year or two." 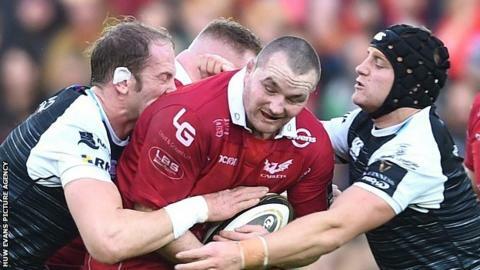 Gough, who was one of 13 Ospreys who started for Wales when they beat England in the opening match of the 2008 Six Nations, is also worried about the impact of a merger on players and staff at the two regions potentially involved. "There'll be mental health issues going right the way through because they're staring down the barrel of not having a job," he said. He also fears more changes at the top level could have a negative impact on crowds at professional games and participation at local club level. "Another thing is getting the crowds in and doing their research and the grassroots rugby is really struggling," he said. "Every grassroots club I've been to in the last couple of years are really struggling. There's bigger issues and they're not addressing them, they're just making a shambolic effort at what they're doing." The WRU have been asked to comment, but are maintaining a policy of staying silent on Project Reset until a formal announcement is made.